On September 12th, 2011, the National September 11 Memorial opened as a“ tribute of remembrance and honor to the nearly 3,000 people killed in the terror attacks of September 11, 2001 at the World Trade Center site, near Shanksville, Pa., and at the Pentagon, as well as the six people killed in the World Trade Center bombing in February 1993”. In it, the names of each of the victims are to be inscribed on bronze plates as “a powerful reminder of the largest loss of life resulting from a foreign attack on American soil and the greatest single loss of rescue personnel in American history”. The state-encouraged mythology around 9/11 has been fed from the day it occurred – with annual events such as collective silences, readings of the name of the victims, or the release of documentary movies keeping it at the forefront of the American collective memory. But in the ten years since 9/11, the reputation of America has suffered immensely, especially across the Muslim World, squandering any sympathy it may have received at the time of the attacks. The fact that the 9/11 mythology has been used, often invoked directly, as justification for illegal wars (Iraq), illegal extra-judicial killings (Predator drones), illegal prisoner abuse (Guantanamo bay, Abu Ghraib), illegal torture (water-boarding, renditions program, secret prison program), disregard for the rule of law has become almost expected, even as the Obama administration, originally invested with the hope of change, has continued to pursue the same policies of what is the American “War of Terror”. American exceptionalism permeates throughout, whether adherence to the rule of law or recognition of suffering. While the 9/11 victims are immortalized, and military deaths are all recorded and honored, the deaths of the more than a million civilians caused by American led “interventions” in Iraq, Afghanistan, and now Pakistan, Yemen and Somalia, are forgotten in the official narrative, summed up in the phrase during the Iraq war of the US General Tommy Franks: “we don’t do body counts”. 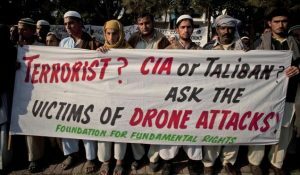 This is the commonality between the victims of 9/11, and the victims of the American war machine engaged in the War of Terror – they are both ultimately victims of American foreign policy. However, there can never be a just comparison drawn between the acts of isolated individuals reacting with the weapons of desperation in what they believe to be last resort and that of a deliberate government policy using the wide-spread apparatus of its imperial state. The destruction, pain, disregard for human life, and criminality of the American government, and by extension its erstwhile ally Britain, since (and prior to) 9/11 is far more terrible than anything the “terrorists” have reaped; but since the West “don’t do body counts” their claims can be ignored, forgotten, or quickly dismissed. Part of the 9/11 myth is that the attack represented a rupture, an initiation of a war with America, with the reality simply being that it was the first time that America’s foreign policy had resulted in such a number of deaths in one incident on home territory. In line with Bush’s “with us or against us” proclamation, several oppressive regimes around the world allied themselves to the American War of Terror, going further in crushing all internal opposition, including non-violent dissenting views, under the guise of “fighting terrorism”. This was done with the full encouragement of the Americans who continued their backing of tyrannical regimes across the Middle and beyond. After all, as Bush stated, al-Qaeda was “linked to many other organizations in different countries, including the Egyptian Islamic Jihad [and] the Islamic Movement of Uzbekistan”, giving further license to the Egyptian and Uzbek dictatorships amongst others to assault their own populations under the guise of fighting al-Qaeda. Highlighting the depth of American complicity in supporting the most vile leaders across the region, and their hypocritical volte-face since the Arab uprisings at the start of 2011 forced them to adjust their policy, it was only 2009 when former Presidential candidate American senator John McCain met representatives of the Gaddafi regime in Tripoli alongside numerous other senators, including Joe Lieberman. According to a cable released by Wikileaks, McCain described the bilateral military relationship as strong, pointing out the training given to Libyan officers in the American military colleges. At the same time, the senators all “recognized Libya’s cooperation on counterterrorism and conveyed that it was in the interest of both countries to make the relationship stronger”. This co-operation between Western intelligence agencies and the Gaddafi regime is currently being exposed as much deeper than previously imagined. Lieberman’s comment that Libya was “an important ally in the war on terrorism, noting that common enemies sometimes make better friends” is all the more ironic given that the liberation of Tripoli supported by NATO was led by a rendition victim of this policy. And so along with encouragement for these regimes came collusion, with the American rendition program sending victims to underground jails across the Middle East in Libya, Egypt, Syria and elsewhere, where they would be “interrogated” (tortured) by the local intelligence forces or the CIA. The rendition program itself is another good example of the continuity of American policy prior to 9/11, given that it was first suggested to Egypt in 1995, with the events in 2001 merely leading to an increase its usage. That the people rendered were possibly tortured by others was of no concern, after all the American public supports torturing terrorism suspects in any case. Ten years on, and the vulnerability that America felt as a result of 9/11 is compounded today by the economic crisis that it faces. And yet the proposed 2012 budget allocates a lop-sided 19.7% for “Defense”. To put the amount in context, the United States spent more on its military in 2010 than the next 19 in the top 20 of largest spenders combined, highlighting the staggering extent of the American war machine. It would not be inaccurate to state that they are now paying for their imperial overstretch, something that is surely unsustainable in the future and which is leading to the drawdown in Afghanistan, a retreat necessitated by financial and domestic considerations rather than meeting any apparent goals. “Mission accomplished” yet again, but this time predator drones will be left behind to murder the natives whether in Afghanistan or Pakistan, a much cheaper option both financially and politically than American boots on the ground. 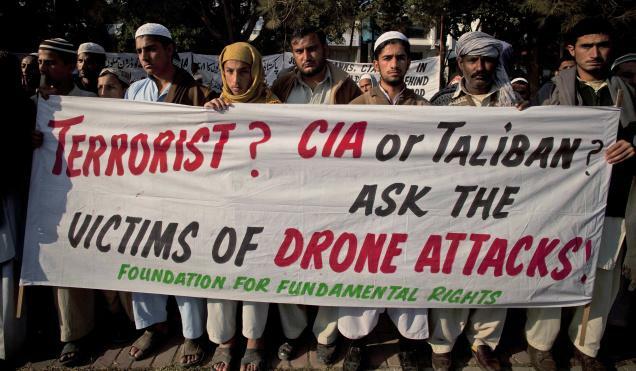 As mentioned by Professor Anatol Lieven, Chair of International Relations and Terrorism Studies at Kings College London, the use of Predator drones in the areas between Pakistan and Afghanistan will inevitably lead to a further cycle of killing, since you “create an even greater desire for revenge among all their relatives, particularly of course if women and children are killed,” encouraging retaliation, given that “there’s a deep feeling in the Pashtun areas that this way of waging war is illegitimate and contemptible and unmanly, basically, because you run no risk”. This is the final tragedy at the end of a decade since 9/11 – and it denigrates the memory of the innocent life lost therein – that it remains the justification for the illegitimate, contemptible and unmanly conduct of the American war machine’s War of Terror, pursued not in the name of justice, but rather a continuation of policies driven by greed and naked political interest to maintain control over the Greater Middle East region and its resources. It is the final irony that, despite its actions, the money it has spent, and the military footprint it has around the world, the uprisings of discontented masses witnessed throughout the Middle East which began against stalwart American allies are now the biggest threat to that hegemony. Despite the hypocritical attempts at an about-turn by various members of NATO to adopt the uprisings in order to manage any process of change in the region, the memory of this last decade will take a long time to fade. Reza Pankhurst is a political scientist and historian, specializing in the Middle East and Islamic movements. He has a doctorate from the London School of Economics, where he previously completed his Masters degree in the History of International Relations. He was imprisoned by the Mubarak regime in Egypt between 2002 and 2006 due to his membership of Hizb ut-Tahrir, during which time he was adopted as a political prisoner by Amnesty International. His latest book, The Inevitable Caliphate? A History of the Struggle for Global Islamic Union, 1924 to the Present, is published by Hurst and available now.